. 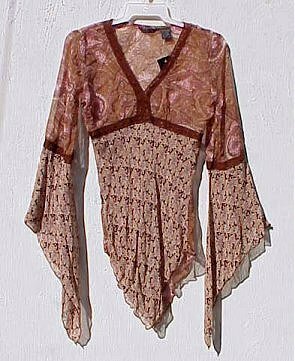 The flowing true brown and beige blouse is gothic influenced with its exaggerated sleeve length, but it is definitely a reflection of a 1960's and 1970's style peasant blouse. The delicate and feminine blouse has a somewhat sheer bodice that is a mix of many colors such as goldish olive, cream, mauve and true brown. The bottom is a mix of true chocolate brown, cream, tan and very pale mauve or pink. This vintage reproduction blouse is cut either for a small chested woman or someone petite, short between the shoulder to the bottom of the breast area. The flowing blouse is hand washable as it is 100% polyester crepe. The blouse is returnable if it does not fit as long as never worn, no damage has occurred and with email approval. Buyer must pay all shipping costs an a $2.00 reprocessing fee if returned.